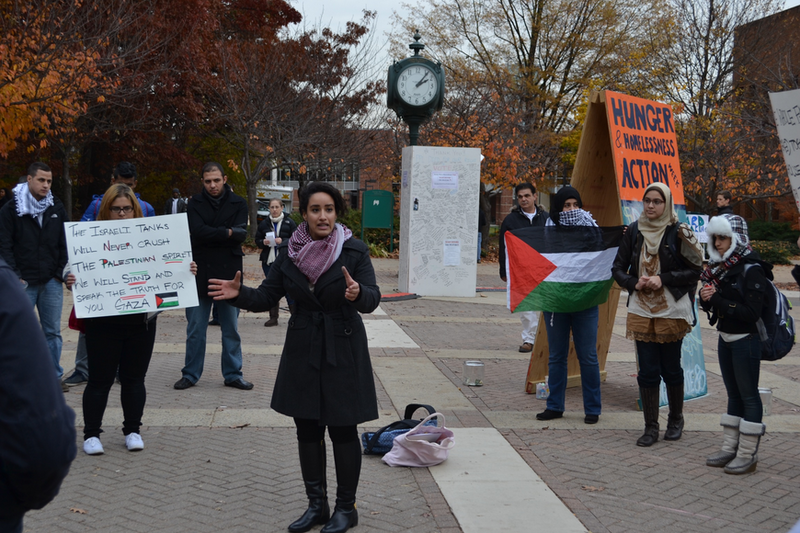 Mason students held a protest on North Plaza on Thursday, Nov. 15, 2013 (photo courtesy of Alex Perry). 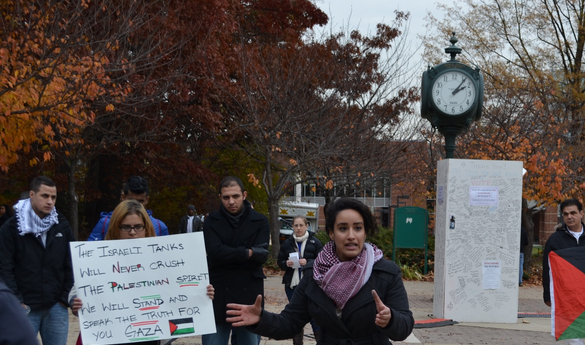 Every February, students supporting the Boycott-Divestment-Sanctions (BDS) movement against Israel pepper university campuses with vitriolic lectures and protests demanding the cultural and academic boycott of Israeli institutions by the international community. They claim that Israel treats Palestinians inhumanely by occupying their territory and racially discriminating against Israel’s own Arab citizens. These, they claim, amount to "apartheid", not unlike the treatment of the South African Blacks before 1994. The truth is that the BDS movement deliberately conflates the Arab citizens of Israel with the stateless Palestinian residents of the West Bank and the Gaza strip, lumping these two categorically very different constituencies together under an imaginary banner to justify their radical agenda. BDSers believe Israel is a "colonial occupier" and has no right to exist, even though it was created in 1948 and admitted to the United Nations. To delegitimize the character of Israel as a Jewish state engaged in a vibrant, sometimes turbulent, but definitely democratic relationship with its minorities, BDSers paint all of the non-Jews of that area with the same brush of victimhood, "apartheid," and "colonialism". The nearly one million indigenous Arab citizens of Israel have very different political priorities from the nearly 4 million Palestinian residents of the Gaza Strip, West bank. These Israelis citizens have the same vote as Jews in Israel's political process, have Arab members of the Israeli Parliament, and have the same standing as Jewish Israelis in the Israeli courts of law. Is Israel perfect in its treatment of its Arab minorities? No. There are differences in the property rights of Jews and non-Jews, as well as differences in access to welfare resources. But in Israel, there are no "Jews only" water fountains, restrooms, or sections of the bus, beaches. A recent poll from the University of Haifa by Dr. Sammy Samouda reveals that 80% of indigenous Arabs of Israel do not wish to become a member of a future Palestinian State, and accept the Jewish character of Israel. Rather, they are engaged in a vibrant political and cultural movement to gain greater recognition and rights within their country, not unlike the minorities in other lands, such as the Shia of Bahrain, the Jews of Iran, and the Christians of Lebanon. The Palestinian territories and refugees and its inhabitants, however, are not citizens of Israel, and are victims of an unresolved set of claims from a sixty-five year old war. These territories are involved in an international border dispute, not apartheid, which is defined as racial or ethnic discrimination against one's own citizens. The issue of Palestinian statehood is a long-standing international stalemate that will require strong leadership to resolve peacefully. It is quite possible that both the Israeli and Palestinian leadership currently do not possess the ability to resolve this stalemate. But the BDS movement turns a blind eye to the actions of all but Israel in order to justify its agenda to de-legitimization. So the next time you see a BDSer waving a poster and calling for a boycott of Israel, ask yourself, "Where is the apartheid? Who are the perpetrators? Who are the victims?" You might find that the answers are much more complicated than simple BDS sloganeering. Jessica Emami is a Ph.D. Student in Sociology at George Mason University. Thoughts or comments? Send us an email at GMUFourthEstate@gmail.com.